Easy plug & play system with a minimum of cables. Valves connect in serial order. Choice of language, auto/manual, input signal, etc. 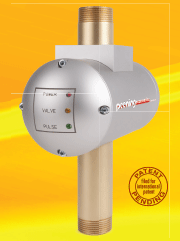 Up to 4 valves with alarm and on/off indication, target/actual flow rate, etc. The media flow rate of a shot peening machine is one of the most important key parameters in the entire shot peening process. It has to be within given tolerances to allow reaching the requested Almen intensity. 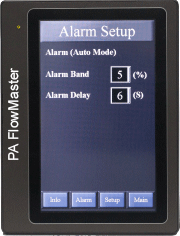 Such a flow rate control unit has to be reliable at all times and should be easy to integrate into either a new or existing machine design. After two years of intensive testing, the German company Peening Accessories is glad to present its PA-15 UltimateValve that works in conjunction with the PA FlowMaster. It can be used in pressure or gravity fed machines. The unit is a precision control valve that regulates media in pressure or gravity feed peening and blasting machines. The valve has a built-in flow sensor that is able to provide closed loop feedback to the shot flow processor. The shot flow processor is a high-end processing device which regulates the media flow rate with auto tune technology. 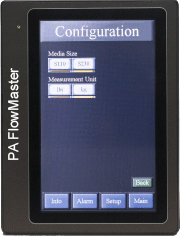 When connected to the PA FlowMaster, the configuration of the PA-15 UltimateValve can be retrieved and manipulated by the users for their desired applications. The equipment can be operated in two modes – manual mode or auto mode. Manual mode allows users to control the valve with constant flow rate, while auto mode enables auto tune technology to regulate the flow rate. 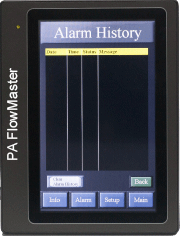 The PA-15 UltimateValve complies with SAE AMS 2430, AMS 2432 and other technical requirements. It only needs a 24V DC power supply to operate. The valve has no moving parts, which ensures low-maintenance operation. 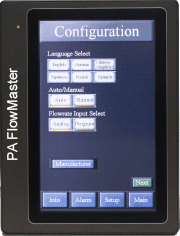 The PA FlowMaster is a managing hub for all PA UltimateValve series, which includes digital I/O and analog signals for communicating with industrial controllers. 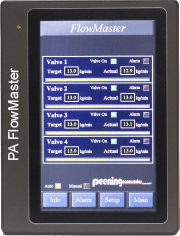 The PA FlowMaster has a built-in touchscreen that manages all valve operations. The controller has several important functions. It can be connected to up to four valves, supports up to six different display languages, has an auto/manual mode, an advanced alarm system and is very user friendly. • Cost savings: One control handles up to four valves! • 7" touchscreen: reduces hardware button damage; flexible on design. • Six languages as standard configuration: English, French, German, Spanish, Japanese and Chinese. Additional languages on request. • Up to 64 recipes that can contain flow rate and product name. • Instant adjustments to up to four different shot sizes (optional). • Instant switch from kg/min to lb/min or vice versa. 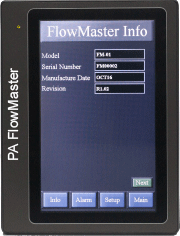 • Displays product info: flow rate, valve status, configuration, alarm, settings, recipes. • Alarm system: flow rate upper/lower limit, connection lost. • Remote commands and recorder output. • Digital I/O and analog signal card. 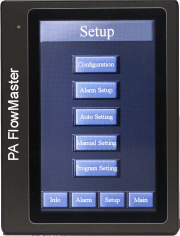 Comparing the PA-15 UltimateValve and PA FlowMaster with existing systems, there are a few features that have not been seen on the market so far. 1) One controller for four valves: This means that many fewer controllers have to be purchased (extensive cost savings). In addition, much less space is needed in the control panel and installation is quicker. 2) 7" touchscreen in six languages: All functions are controlled via touchscreen. 3) Choice of shot size: This optional feature incorporates a different control algorithm and allows switching to another shot size without calibration. This reduces the downtime of a machine. The first calibration of the valve is done according to the shot size requested by the customer. 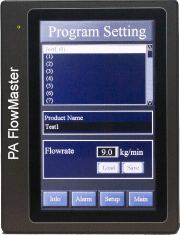 However, the FlowMaster has the means to save different calibration algorithms that allow changes of media size without new calibrations. This is an optional feature. It requires the manufacturer to carry out an additional calibration for each shot size and valve that is leaving the site. Presently, calibration centers are available in Europe and Asia. Within the next months, similar calibration centers will be opened at different locations. If the customer requires calibration, it will be done without any time-consuming overseas shipment and extensive paper work. For shipment to or within Europe it is very important to be in line with the CE declaration; otherwise, it could happen that the product is detained at customs. To avoid such delays, very annoying for an OEM, the shipment papers have a "Declaration of Incorporation for partly completed machine" attached, which states that the part is allowed to be integrated in a machine that has CE markings. This new generation of valves has been tested in-house and at various OEMs with all different shot and cut wire sizes. It implements some technologies that not have been used so far for flow rate controls in the shot peening and blasting industries. Valves for other flow rate ranges are presently in development, not only for pressure and gravity-fed systems, but also for wheel peening and blasting machines.